“There is nothing you can buy, achieve, own or rent that can fill up that hunger inside for a sense of fulfillment and wonder.” —Annie Lamott On the recent Bank Holiday weekend (there are eight such legal holidays here; Brits take vacation time seriously), Dave and I traveled to the midlands for a walking holiday in the Peak District National Park. Not to be confused with the Lake District, the Peak District comprises 555 square miles of rugged upland between the densely populated urban areas of Sheffield and Manchester. Before arriving at our B&B, we made a side trip to Calke Abbey, a large Baroque mansion dating from the early 1700’s. An impressive example of the English country house in decline, the vast edifice and stable complex appear untouched since the 1880s. 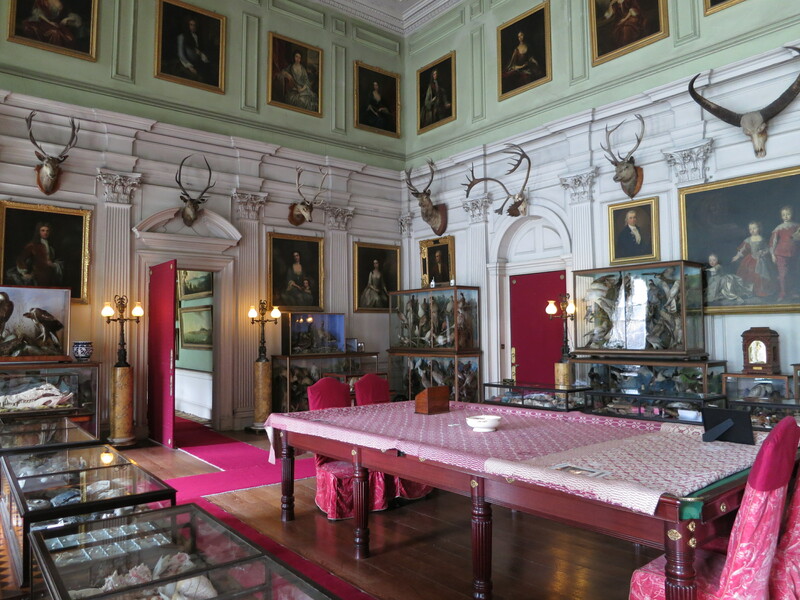 Stuffed to the gills with former owners’ furniture and relics, from taxidermy to timepieces, cutlery to chamber pots. And everywhere, the patina of time. Well pleased with our detour to experience a slice of history in its natural state, we departed Calke and followed a scenic route through green hills cross-hatched with miles of tumbledown stone fencing to Alstonefield Manor B&B—recommended by a business associate of Dave’s—our home away from home for the next three nights. From the moment we peered through the garden gate and found our way into the entry hall, our stay proved a treat for the senses and a balm to the spirit. Anna especially loved the commodious Boot Room—an element currently missing at Long Barn—featuring a long, comfortable bench to sit on when taking shoes off and on, and plenty of space for boots and brellies, coats and hats. Our hosts Jo and Robert Wood, both professionals in the design world, have lavished their expertise on the interior of their home, decorating each room with muted colors, antique furniture, artifacts and flowers, and creating a series of tableaux worthy of the pages of House Beautiful and Interior Design. Each morning at 8:30 sharp, a tray with two china cups, milk, sugar and a pot of tea appeared outside our door, accompanied by a cheery voice announcing “Morning tea!” A half hour later, we made our way downstairs to breakfast in the wood panelled dining room. We shared one long, candle-lit table with the six other guests in residence, and though the company was charming, the ambiance and food delicious, the communal aspect of the meal prompted Dave to later confide in me: “I don’t like having to make conversation with a group of strangers first thing in the morning.” For me, the compulsory socialising was less onerous than the enforced timetable, but either way, morning is time of day when we prefer to gently ease back into the world at our own pace—especially when on holiday. So…self-catering accommodation, from now on? Despite driving wind, chilly temperatures and intermittently wet weather, we bundled up and walked each day, determined to get some exercise and enter into the landscape. Anna was thrilled to spy a ‘sheepfold,’ a circular, dry stone (ie. no mortar) fenced pen, one of the most ancient types of livestock enclosure known, in use as early as the 1100’s. The first evening, we dined at the gastropub in Alstonefield, ably managed by Jo’s sister, Emily. Only a ‘short stumble’ from our bed at the manor, The George proved cosy and inviting, with wood fires warming both rooms. So impressed were we with the pub, the food and the wine selection that we returned the next two nights. When we weren’t walking, eating or drinking, we were visiting historic monuments. We avoided nearby Chatsworth, often named as the UK’s favourite country house, in favour of several smaller, lesser known places, in hopes of eluding holiday weekend crowds. Our strategy worked (the inclement weather might’ve helped) and we wandered through Haddon Hall, a fortified medieval manor house dating from the 12th century, virtually by ourselves. Owned by the same family since 1567, and possibly the most perfectly preserved such place in England, Haddon Hall was shut up for 200 years, from 1700 until the 1920’s, thus sparing it the ravages of warfare, family misfortune and changing fashions. Even the Elizabethan gardens are mercifully intact. Next we attempted a visit to Wingfield Manor, the reputedly impressive ruins of a palatial medieval manor house and one of the sites where Mary Queen of Scots was housed (ie. imprisoned) during her peregrinations. But it was not to be. A sign informed us that the ruin is now privately owned. But this is England, where historic sites are thick on the ground, so we didn’t have to drive far to find Hardwick Hall. Actually two halls, one in ruins, the other exquisitely preserved. 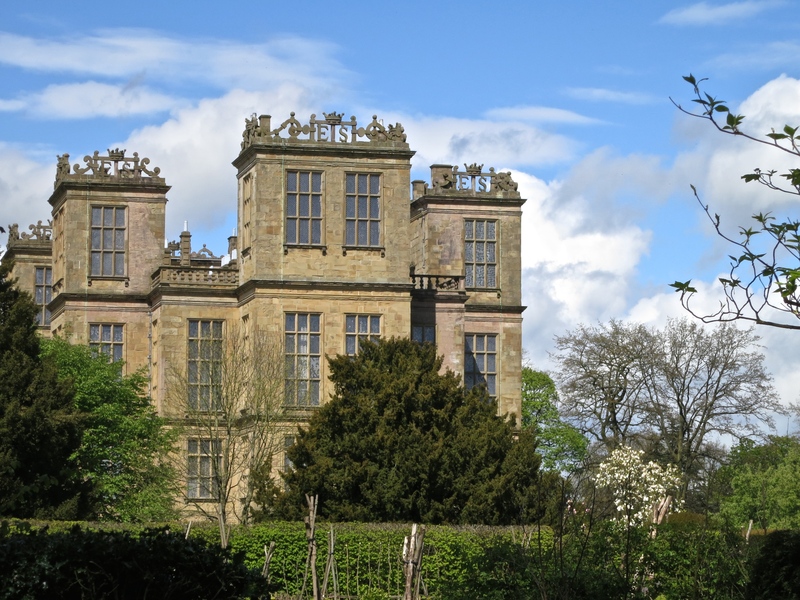 The ‘new hall,’ begun in 1590, was built to impress by Bess of Hardwick, a.k.a. Countess of Shrewsbury. Her initials, emblazoned in silhouette along the tops of six towers—E.S. for Elizabeth of Shewsbury—are the first thing we notice as we approach the grand home. We also marvel at the size and symmetry of glass-paned windows making up the stately facade. In fact, Hardwick’s glittering array of window glass inspired the rhyme, “Hardwick Hall, more glass than wall.” Architecturally stunning, though by all accounts, a terribly cold and draughty place to live. Miss you guys. I was at Calke Abbey just a couple of weeks ago in April with my mum! beautiful place. thanks for continuing to post such beautiful photos and inspiring commentary.